With the addition of media library PDF previews to WordPress 4.7, PDFs got a small nod from the creators of our favorite CMS. But the fact remains that WordPress still doesn’t give you very many options for working with PDFs. Uploading them to the media library is simple enough, but after that, you’re pretty much on your own. To remedy that, I’ll discuss some of the ways in which you can use plugins and third-party tools to embed and share PDFs on your WordPress site. Why Do You Need WordPress PDFs? There are a few situations in which you might find yourself needing to integrate PDFs into WordPress. Let’s start at the beginning: embedding PDFs into WordPress. While blog posts are certainly popular, there’s still a great deal of information that’s only available in PDF form. For example, if you deal with data and statistics, you’ll often run into tables and graphs that are only available as part of a PDF. If you have the rights to do so, embedding those PDFs is a great way to make the same data available to all of your readers. Beyond embedding, you may run into situations where you want to distribute content via PDF. This could be PDF versions of your own posts, a unique PDF that isn’t available anywhere else, or someone else’s PDF (again, only with the proper licensing!). I’ll cover a few different ways in which you can distribute WordPress PDF content. I prefer the first option because it’s not reliant on an external service, but I’ll cover both just in case you don’t want to use a plugin. With it installed, you can insert embedded PDFs into your posts from your WordPress Media Library. The process is essentially identical to inserting an image. Or, you can also use a simple shortcode. In the plugin’s settings, you can customize the default dimensions for embedded PDFs. Or, you can allow embedded PDFs to fill the viewable area. If your PDF has multiple pages, users can navigate with forward and back buttons. PDF Embedder is simple to use and has a 4.8-star rating on over 70,000 active installs, making it by far the most popular option. Among other uses, Scribd is a popular service for housing PDF documents. You can use it to store your own PDF documents or embed documents that already exist on Scribd. It’s simple to use – all you need to do is find the Embed option on the page of any Scribd-hosted PDF file. 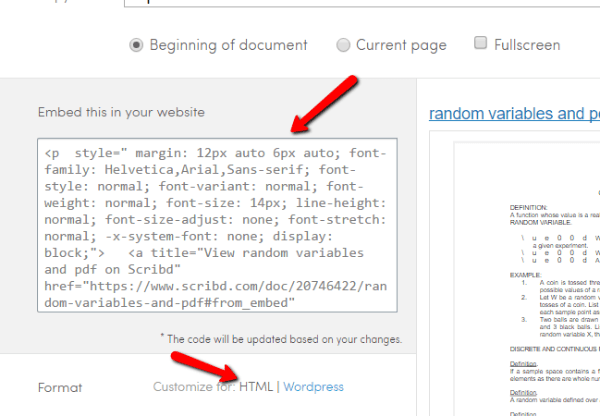 Then, copy and paste the embed code into the Text tab of your WordPress Editor. If you’re using the Divi Builder, you can add it to a < code > module. Note: while Scribd does include an embed option for WordPress, you do not want that. Choose the HTML option. The WordPress option only works for WordPress.com sites. While I’m sure your visitors love reading your content on your actual website, there are times when they might want to download a copy for offline usage. Read your post when they don’t have an Internet connection. Download a printer-friendly version of your post. Personally, if I find an especially helpful post, I like to save an offline version so that I’ll always have a copy in case the website goes offline at some point in the future. To help such readers, you can add a “Download as PDF” button to all of your posts and pages. While some browsers already have a “Save as PDF” option, the difference is that a dedicated button allows readers to download only the body of your post. DK PDF is free and works with posts, pages, and even custom post types. As the name suggests, PDF & Print adds both a “Download as PDF” button and a “Print” button to your WordPress posts. You can add buttons to your posts, pages, archives, and custom post types. You can also choose where on the page your buttons display. It lets you customize some styling for your PDFs, but if you want to add a custom logo and header/footer, you’ll need to opt for the pro version. For that reason, I prefer DK PDF. If you want to go beyond creating downloadable PDFs for individual posts, you can also turn your entire WordPress content library into a PDF in order to create an eBook. I won’t go too deep into this topic because Joe just wrote a great post about turning WordPress content into an eBook. If you’re interested in this use, give his post a read. Lead magnets are essentially incentives offered to readers in exchange for opting in to your email list. Downloadable PDFs are one of the most common ways to create a lead magnet. Just like with creating eBooks, if you’re interested in learning more about lead magnets, I’ll send you over to Joe’s list magnet post, rather than covering well-worn ground here. Whether you’re embedding or sharing, I hope you gained a little insight into how you can handle PDFs better with WordPress. I’d love to hear how you all implement PDFs into WordPress. I personally only use them for lead magnets, but it would be great to get some ideas for other uses. Every designer is sending proposals via PdF or using a tool like Bid Sketch. It’s a clunky process that doesnt lend well to any kind of automation. Surely there would be huge demad for an in-house way of publishing a pasword protected proposal on your own site, that’s downloadable and signable (with approveme for example). Question. My customer has like 40 or more PDF docs and we want to link them off of our medical pages etc. I of course know how to do it in normal HTML5 website and just link them and FTP up to the server. But I never have used some many PDFs in WordPress and I am nervous the site would get so large with around 60 pages of HTML, lots of videos and now lots of PDFs. Is it a problem to link to PDFs and have them right in WordPress database, or is it better to link the to outside storage? I do not want to embed the PDF but your article is very good and I can use that for other customers. Is this best way to drag the PDFs into my media in WordPress and then link to it from my wordpress pages? Like I said above I just thought adding that much PDF content to WP might not be best option. Thank you for any suggestions. At this point I see no advantage in importing PDF’s to WP so I would keep them separate. Hi, very good article, Colin. I’ve been thinking about using more PDFs on my WordPress site. Just wondering, do you have a suggestion for working around the “previewing” of a PDF? I would like for readers to be able to click on a link and go directly to the actual, full-sized PDFs that I upload into the media library (not to a post or page with an image preview of the PDF). Am I overlooking something that I’m not doing? Then I have another question. Is there a way or plug-in so that the WordPress search function will read the text CONTENTS of PDFs in the media library to produce results (not just the pdf file names, or post or page names in which PDFs are embedded? I’ve used PDF Embedder and was very happy with it. I had not heard of DK PDF. I will definitely have a look at it. I’d like to download this post as a .pdf. How would I do that? How do PDF’s perform with SEO? Are they picked up at all or should common search terms related to the content of the PDF be included in the media description or alt text? Don’t forget “Document Gallery” which displays PDF’s (and Word, Excel etc) as thumbnails which can be generated automatically. That allows you to insert Document Gallery shortcodes like “Show newest 6 PDF’s of the category ‘newsletter’ sorted by the newest first”. Extremely useful in a organization that by habit creates a lot of information in legacy applications. I use it in an intranet site based on divi. With a few lines of CSS you’ll get a responsive layout that fits perfectly in divi. It would be especially useful for the Elegant Theme Monarch social-sharing plugin to also include a way to add a “Download as PDF” button to its stellar lineup of integrated tools. Great post. Very timely and helpful! I downloaded the DK PDF plugin, yet after updating the settings, it’s not clear how to set the button with the particular pdf that I want for each post. Can you provide more insight on this? They’re Support section on their site wasn’t helpful at all. Amazing Article. Right on time.. You have been really helpful with this amazing post. Is this plugin able to integrate with the modular divi post layouts, where should it be inserted as shortcode?